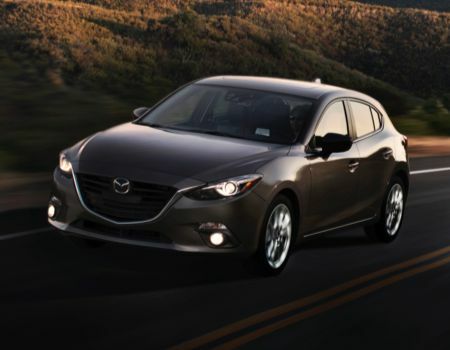 Along with a completely new and out-of-the-box design theme, the 2014 Mazda3 brings a choice of Skyactiv powertrains and a host of state-of-the-art comfort, convenience and safety technologies. Mazda sent along the 5-door Grand Touring model for our turn behind the wheel, and while I have continuously pledged my affection for Mazda3 since its introduction a little more than a decade ago, I absolutely love this third-gen model. This car is comfortable, quiet, smooth, sporty, fuel-efficient and, in my opinion, one of the best-looking cars on the road today. 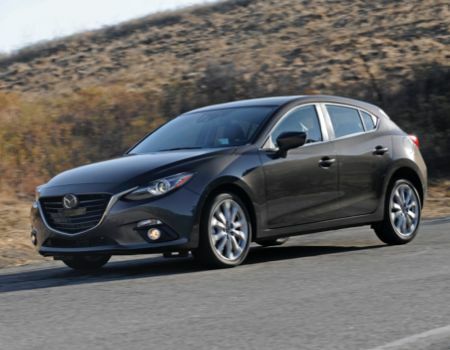 Similar to the Mazda6 we reviewed a short while back, the 2014 Mazda3 draws from the automaker’s KODO “Soul of Motion” design language. Its body panels seem to flow like the wind, whether it is zipping around the twisty backroads or sharing quality time with other vehicles in the daily commute. The new Mazda3 shares nothing with its predecessors, meaning it sheds all past association with global Ford-based products, as Mazda is producing vehicles all its own these days. For 2014, the model is offered in sedan and hatchback models that ride on a longer wheelbase than previous year models while overall lengths are slightly shorter. While overall height is also slightly reduced, interior head- and legroom have been enhanced for the third-generation cars and overall weight has also been reduced. The new design reduces overall coefficient of drag and combined with active grille shutters and i-ELOOP capacitor-based regenerative engine braking system the new car not only slices through the wind better but uses new technology to gain additional fuel economy. 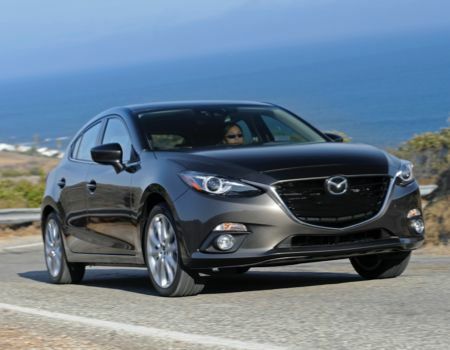 Two engines are offered for the 2014 Mazda3 – a 155hp 2.0-liter or 184hp 2.5-liter inline four-cylinder Skyactiv gasoline powerplants. Each is backed by choice of six-speed manual or automatic gearboxes with our tester featuring the larger engine and Skyactiv-Drive automatic transmission with sport mode. While we enjoyed a nice 28 mpg city and 38 mpg highway fuel economy, this same engine in the larger Mazda6 brought us 40 mpg on the highway. Hmmm. 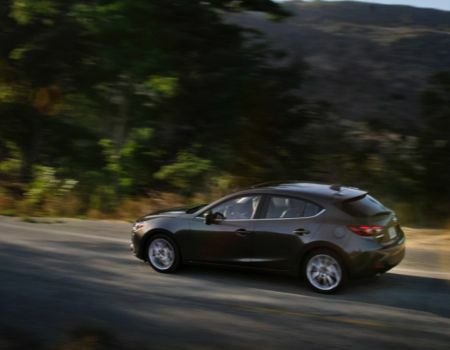 Mazda offers the new 3 in four trim levels – SV, Sport, Touring and Grand Touring. A designation of “i” refers to the smaller 2.0-liter engine onboard while vehicles equipped with the 2.5 model are given an “s” designation. Our fully laden Grand Tourer s model featured the i-ELOOP technology along with new i-ACTIVESENSE safety system that includes High Beam Control, Adaptive Front Lighting System, Lane Departure Warning, Blind Sport Monitoring, Rear Cross Traffic Alert, Forward Obstruction Warning, Mazda Radar Cruise Control and Smart City Brake Support automatic braking feature. New for the 2014 Mazda3 is Mazda Connect, the automaker’s new HMI (Human Machine Interface) infotainment system that offers head up display along with text-to-voice technology, Bluetooth connectivity and host of in-car apps, and all of this integrated with 7-inch color touch display monitor and SD card-based navigation system. The Grand Touring model brought a host of creature comforts including leather everywhere, stylish 18-inch alloy wheels, power moonroof, premium Bose audio system with SiriusXM satellite radio, rearview camera and paddle shifters just to name a few. Pricing begins at $26,495, with our tester arriving with a final sticker of $29,185.